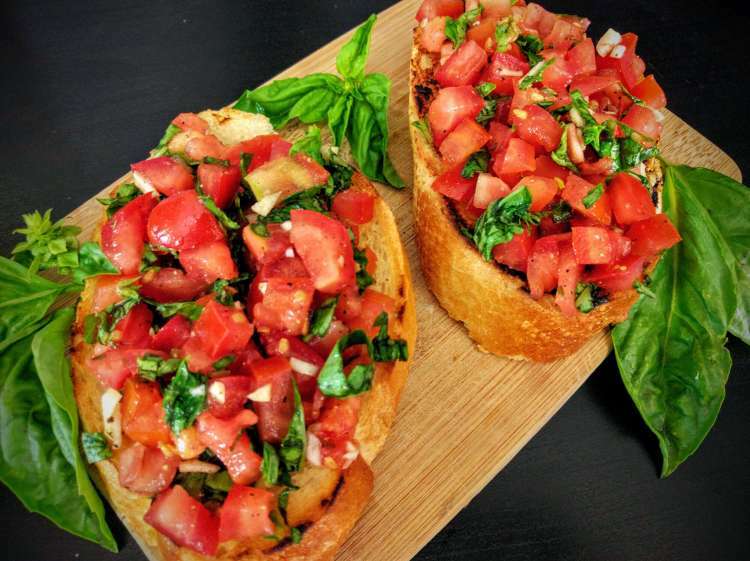 In a big bowl, combine finely chopped tomatoes, chopped or thinly sliced basil leaves and minced garlic. Add 1 tablespoon of Balsamic Vinegar, 1 teaspoon of Olive Oil, 1/2 teaspoon Black Pepper Powder and 1/2 teaspoon Salt, or to taste. Mix all the ingredients well and let the mixture sit for an hour on the countertop or in the refrigerator, if you have the time. This allows for the all the flavors to blend together. Slice a French baguette or an Italian bread diagonally into 1/2 inch thick slices. Brush the bread slices with butter or olive oil. Optionally, you can also add 1/2 teaspoon Garlic Powder to the butter or oil before brushing it on the bread. Toast or bake the bread slices till they are crispy and golden brown. Spoon the tomato mixture generously over the toasted bread slices and serve immediately. You can also place the bread and tomato mixture separately and let people top it themselves.